The notion of a free will is a notion we have inherited from antiquity. It was first in antiquity that one came to think of human beings as having a free will. But, as with so many other notions we have inherited from antiquity, for instance, the notion of an essence or the notion of a teleological cause, we have to ask ourselves whether the notion of a free will has not outlived its usefulness, has not become a burden rather than of any real help in understanding ourselves and what we do. Contemporary philosophers for the most part dispense with the notion of a free will, and the few attempts which are still made to give an account of what it is to have free will seem rather discouraging. In this situation it may be of some help to retrace our steps and see what purpose the notion of a free will originally was supposed to serve, how it was supposed to help our understanding, and whether it was flawed right from its beginnings, as we might now see in hindsight. In these lectures it is in this spirit that I want to pursue the question "When in antiquity did one first think of human beings as having a free will, why did one come to think so, and what notion of a free will was involved when one came to think of human beings in this way?" To raise this question, though, is to make a substantial assumption about the very nature of the notion of a free will. I assume, and I will try to show, that this notion in its origins is a technical, philosophical notion which already presupposes quite definite and far from trivial assumptions about ourselves and the world. It is for this reason that I presume its having an identifiable historical origin. In contrast, this is not the view scholars took until fairly recently. They went on the assumption that the notion of a free will is an ordinary notion, part of the repertory of notions in terms of which the ordinary person thinks about things and in terms of which the ancient Greeks must have already been thinking all along. And on this assumption, of course, there is no place for the question of when the ancients first came to think of human beings as having a free will. The assumption that the Greeks all along must have been thinking of human beings as having a free will seems truly astounding nowadays. For, if we look at Greek literature from Homer onwards, down to long after Aristotle, we do not find any trace of a reference to, let alone a mention of, a free will. This is all the more remarkable, as Plato and in particular Aristotle had plenty of occasion to refer to a free will. But there is no sign of such a reference in their works. Scholars did indeed notice this with a certain amount of puzzlement. But it did not occur to them to draw what would seem to be the obvious inference, namely, that Plato and Aristotle did not yet have a notion of a free will and that it was for this reason that they did not talk of a free will. As eminent a scholar as W. D. Ross again could note that Plato and Aristotle do not refer to a will, let alone a free will. But even Ross concludes that we must assume that Aristotle, as Ross puts it, "shared the plain man's belief in free will." And he explains Aristotle's failure to refer to a free will explicitly as due to the fact that Aristotle did not think hard and carefully enough about the matter to arrive at a philosophical account of what it is to have a free will. But why should we assume in the first place that Aristotle believed in a free will? To understand the assumption Ross and earlier scholars make, we have to take into account the following. Let us assume that it is a fact that, at least sometimes when we do something, we are responsible for what we are doing, as nothing or nobody forces us to act in this way; rather, we ourselves desire or even choose or decide to act in this way. Let us also assume, as is reasonable enough, that this is what the Greeks believed all along. It certainly is something Aristotle took to be a fact. The notion of a free will was originally introduced within the context of a particular theory, namely, a late Stoic theory, in a way specific to this theory, to account for this presumed fact. But once this notion had been introduced into Stoicism, rival theories, either Peripatetic or Platonist, developed their own version of a notion of a free will, which fitted in with their overall theory. In fact, it was a notion which was eagerly taken up by Christians, too. And, largely due to the influence of mainstream Christianity, it came to be a notion which, in one version or another, gained almost universal acceptance. People quite generally, whether followers of Stoicism, Platonism, or mainstream Christianity, felt committed to a belief in a free will. Even if they themselves were not able to give a theoretical account of what a free will is, they relied on such an account's being available. This had the effect that the mere assumption that sometimes we are responsible for what we are doing, since we do it not because we are forced to but because we ourselves want to, came to be regarded as tantamount to a belief in a free will. From here it was just a short step to the assumption that the mere notion of a free will was an ordinary notion, with philosophical theory coming in only to give a theoretical account of what it is to have a free will. This is why Ross could assume that Aristotle shared the plain man's belief in a free will but failed to give a theoretical account of that. It seems to me to be clear, though, that we should carefully distinguish between the belief in a free will and the ordinary belief that at least sometimes we are responsible for what we are doing, because we are not forced or made to behave in this way but really want or even choose or decide to act in this way. This belief in a free will is involved in some theoretical accounts of what we ordinarily believe. But it is not to be identified with this ordinary belief. And it seems to me that Aristotle is a good example of a philosopher who is committed to the ordinary belief but does not resort to the notion of a free will to account for this belief. Hence, since even Aristotle does not yet talk of a free will, we should assume that he did not yet have a notion of a free will. This indeed is what scholars nowadays are generally agreed on. The change of scholarly opinion is largely due to the fact that philosophical discussions, of the kind we find, for instance, in Gilbert Ryle's The Concept of Mind, have persuaded scholars that the notion of a free will is at best a highly controversial notion. In light of this, Aristotle's failure to refer to a free will is no longer regarded as a cause for puzzlement but by many is registered with outright relief. 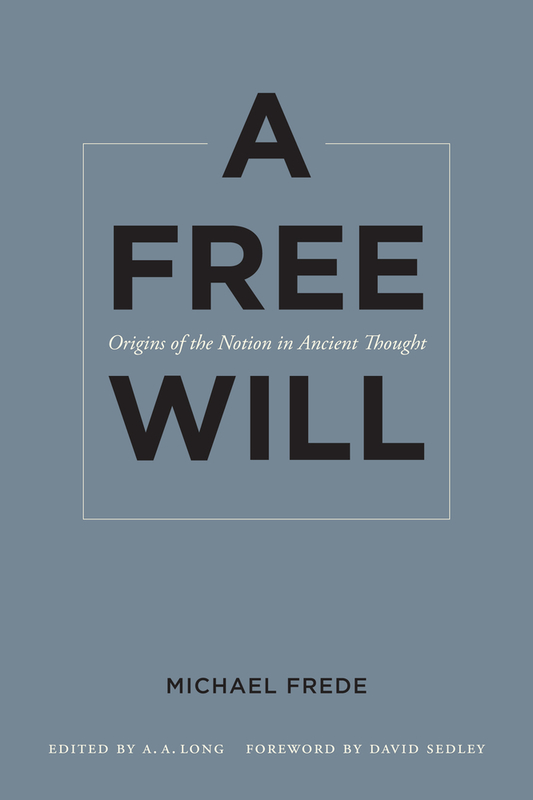 Once one finally comes to see that it is not the case that the Greeks all along had a notion of a free will and that we do not yet find this notion even in Aristotle, the question naturally poses itself: When did the notion of a free will arise? And so more recent scholars have begun to inquire into this question. By far the most substantial attempt to answer this question was made by Albrecht Dihle in his Sather Lectures of 1974, which were published by the University of California Press in 1982 under the title The Theory of Will in Classical Antiquity. This book remains the most important contribution to the subject. One must admire the wide learning and insight which went into its writing. But, even if one does not dispose of the kind of learning Dihle does, one cannot help being struck by one fact about his account which pervasively shapes his book. It is an account which is focused on a highly specific notion of a free will. What Dihle attempts to lay bare and to shed light on is the origin of this particular notion of a free will. He calls it "our modern notion of will." This cannot fail to provoke two reactions. To begin with, we should query the phrase, "our modern notion of will," especially since Dihle assumes that this notion of will is a notion of a free will. In light of what we have said before, he hardly seems entitled to the assumption that there is one notion of a will, and a free will at that, which we all share. Dihle talks as if a certain notion of the will, though not there all along, became common currency from a certain point onwards up to the present. But this does not seem to be true. He is of course perfectly entitled to a view about how we all should or would conceive of the will, if we had properly understood what a will is. But, if we then look more closely at what Dihle has to say about the will, it turns out to be a notion of a free will which is dangerously close to the kind of notion which philosophers have been attacking, a notion which is supposed to do justice to the presumed fact that we can do something by sheer volition, by a sheer act of the will. Second, the very phrase "our modern notion of will" quite rightly reminds us that history presents us with a wide variety of versions of a notion of a free will, which differ quite substantially from Dihle's favored notion, presumed to be our notion. In part these differ in that, as he puts it, they are much too "intellectualistic" and not "voluntaristic" enough. Dihle passes over all such notions with little or no discussion, as they cannot count as notions of a will in what he takes to be our sense of the concept. It seems to me that Dihle does indeed contribute a great deal to our understanding of the historical origins of a specific notion of a free will-one that is still quite widespread and that many may think captures the way we ought to conceive of the will as such. But my aim is completely different from Dihle's. I do not aim to elucidate the origins of some specific notion of a free will which we might have, let alone a notion I myself favor. For I regard my inquiry as purely historical. I do not want it to depend on, and be shaped and slanted by, a notion of a free will which at best can be regarded as philosophically quite controversial. Rather, I am interested, as I said at the outset, in trying to find out when and why a notion of a free will arose in the first place and what notion this was. I will then try to trace the history of this notion to see whether and how it changed in the course of the discussions to which it gave rise in antiquity. In this way, I hope, we shall also be able to identify the ancestor of Dihle's favored notion of a free will or, for that matter, the ancestors of any later notion of a free will. It is in this sense that I plan to talk about the origins of the notion of a free will. Now, though I do not presuppose a specific notion of a free will, let alone want to endorse or advocate some specific notion of it, I do rely on something like a general idea of a free will, something like a schema which any specific notion of a free will or any particular version of the notion of a free will, at least in antiquity, will fit into. I do not arrive at this general idea or schema on the basis of some philosophical view as to what any notion of a free will has to look like but rather with the benefit of historical hindsight. That is to say, I have looked at the relevant ancient texts and have abstracted this schema from those texts which explicitly talk of a will, the freedom of the will, or a free will. In having such a schema, we shall at least have a general idea of what we are looking for when we investigate the origins of the notion of a free will but without having to commit ourselves to any particular view, ancient or modern, as to what a free will really is. It should be clear that in order to have any such notion, one must first of all have a notion of a will. As a matter of historical fact, it turns out that a notion of a will is not necessarily a notion of a will which is free. In any case, in order to have a notion of a free will, one must, in addition to the notion of a will, also have a notion of freedom. These notions of a will and of freedom must be such that it makes sense to say that we have a will which is free. In order to get any notion of a will at all, one must assume the following: Unless one is literally forced or made to do something in such a manner that what one is doing is in no way one's own action (as when one is pushing something over because one is pushed oneself), one does what one does because something happens in one's mind which makes one do what one does. Moreover, one has to assume that what happens in one's own mind which makes one do what one does is that one chooses or decides to act in this way. Or at least one has to assume that there is something going on in the mind which can be construed as a choice or decision. We need not worry for the moment about this qualification or its significance. Thus, for instance, if one feels hungry or feels like having something to eat, one might or might not choose or decide to have something to eat. If one then does have something to eat, it is because one has chosen or decided to have something to eat, since one feels hungry. But the notion of the will, at least in antiquity, involves a notion of the mind such that the mere fact that one feels hungry will not yet explain why one is having something to eat. This is supposed to be so, because, even if one does feel hungry or does feel like having something to eat, one might choose or decide not to have anything to eat because one thinks that it would not be a good thing to have something to eat now. One might also decide to have something to eat, though one does not feel hungry at all, because one thinks that it would be a good thing to have something to eat. But, in any case, for there to be an action that is one's own action, there is supposed to be an event in one's mind, a mental act, a choice or decision which brings about the action. The notion of a will, then, is the notion of our ability to make such choices or decisions which make us act in the way we do. It is crucial for the notion of the will that this ability differs greatly from person to person, as different people not only have different thoughts about what is or is not a good thing to do but also have quite different feelings about different things. This is why different people in the same situation will make very different choices and hence will act quite differently. It is also crucial for the notion of the will that it is an ability which needs to be developed, cultivated, and perfected. One can get better and better at making choices, just as one can get worse and worse. One can choose or decide to improve one's will, one's ability to make choices. The standard Greek term for the will is prohairesis, literally, "choice" or "disposition to choose." Later boulēsis and, in particular, thelēsis will also be used in this sense, especially in Byzantine times. The standard Latin term, of course, is voluntas. The Greek term for the relevant notion of freedom is eleutheria. This term provides us with some guidance as to how the notion of freedom we are interested in is to be understood. As the very term indicates, it must be a notion formed by analogy to the political notion of freedom. According to the political notion, one is free if one is a citizen rather than a slave and living in a free political community rather than in a community governed, for instance, by a tyrant. This political notion of freedom is two-sided. It is characterized, on the one side, by the laws which the citizens of the community have imposed on themselves and, on the other side, by there being no further external constraints on a free citizen which would systematically prevent him from doing what he could reasonably want to do in pursuit of his own good, in particular from living the kind of life he could reasonably want to live. It is crucial that this freedom, to put the matter in a grossly simplified form, almost invariably seems to be understood as a freedom from external constraints which go beyond the acceptable constraints involved in living in a political community and which would systematically prevent one from doing what it takes to have a good life. Living under a tyrant and being a slave are regarded as involving such constraints, as the tyrant and the slave master, by definition, impose constraints on what one can do which systematically prevent one from having a good life, at least given a certain traditional understanding of what a good life amounts to. The notion of freedom we are interested in is formed by analogy to this political notion, but its precise relation to the political is never definitely settled, in good part for political and social reasons; being formed by analogy to the political notion, it also inherits its double-sided character. Thus the ability of a free person to have a good life is understood more precisely as the ability to live a good life in what we, not very helpfully, might be tempted to call a moral sense. The lack of clarity about the relation between the political notion and this personal notion of freedom in part is due to a lack of clarity about the relation between the good life one is able to have when one is politically free and the good life one can live if one has personal freedom. The tendency among ancient philosophers, needless to say, is to claim that one can live a good life even under a tyrant or as a slave. What, then, are the external constraints which this personal notion of freedom envisages which could systematically prevent us from doing what we need to do in order to live a good life, assuming that the constraints a tyrant or a slave master could impose on us do not count as such? The answer, in a nutshell and again very grossly simplified, is that at the time when the notion of a free will arises, there are any number of views, some of them widespread, according to which the world we live in, or at least part of the world we live in, is run by a tyrant or a slave master or a whole group of them. We should not forget that even Christians like Augustine or John of Damascus had no difficulty in thinking that the right way to characterize our relationship to God is to say that we are slaves of God. Now the Christian God is a benevolent agent who provides for his slaves in such a way as to enable them to live a good life. Even on this view there is an obvious tension between our being free and our being slaves, one may even say at least an apparent contradiction. But there were lots of other views, according to which those who rule the world, or our sublunary part of it, are far from benevolent, far from concerned about our well-being. There are, for instance, the so-called archontes, the rulers or planetary gods who rule the sublunary world and determine what happens in it, including our lives, so as to fit their designs and ideas and to serve their interests as they perceive them. They do not care about what this does to our lives or to our ability to have or to live a good life. Indeed, they might try to do what they can to make it impossible for us to live a good life. There is also a widespread view, which we find among groups (following some early Christian authors like Irenaeus) we have come to call "Gnostics," according to which the agent who created the visible world we live in, the demiurge or creator, is a being which pursues its own interests without regard for what this does to us, a being lacking in wisdom and goodness, as one can see from the fact that it deludes itself into thinking that it is God and demanding worship. This view, if held by Gnostics, as a rule seems to be combined with the view that this God is the God of Jewish scripture, who created this world which in all sorts of ways reflects his lack of wisdom and goodness, for instance, in that it puts at least many, if not all of us, into a position in which it is impossible to live a good life. It is against the background of a large number of such views that the notion of freedom we are interested in emerges. To say that human beings are free is to say that the world does not put such constraints on us from the outside as to make it impossible for us to live a good life. These views will strike most of us as extremely fanciful. But we should keep in mind that late antiquity was full of such views, which exercised an enormous attraction. And we should also keep in mind that there were other views which, though much less fanciful, were also perceived to put at least into question whether we are free. The views in question assume some kind of physical determinism, according to which everything which happens, including our actions, is determined by antecedent physical causes and is thus predetermined. The nearest we ever get in antiquity to the kind of physical determinism we are now thinking of, when we talk about determinism, is in Epicurus, if only for Epicurus to reject it without much of an argument. Epicurus is concerned that the kind of atomism introduced by Democritus, and espoused by himself, might be misunderstood as entailing a view according to which everything which happens, including what we do, is predetermined by an endless chain of antecedent causes. If this were true, nothing that we do would in any substantial sense depend on us. For the conditions from which it would ineluctably follow that one day you would exist, that you would be this sort of person with those beliefs and those desires, and that in a certain situation you would respond to this situation in this way, would already be there all along. These conditions would have come about without any thought of you, without any regard to you or your life, and you certainly would have had no active part in bringing them about. So your action would just be a part of how the world ineluctably unfolds from antecedent conditions which have predetermined your action long before you existed. It is almost impossible for us not to understand Democritus in the way Epicurus rejects. Democritus assumes that all there is are atoms moving in a void. They collide and rebound, form transient compounds, among them compounds which are relatively stable, owing to the configuration of their constituent atoms. What we call "objects," including plants, animals, and human beings, are such compounds. These entities, owing to the particular configurations of their constituent atoms, display a certain regularity in their behavior. We can hardly resist the temptation to assume that Democritus must have thought that the atoms move, collide, or rebound according to fixed laws of nature, such that everything which happens ultimately is governed by these laws. But it is perfectly clear that Democritus has no idea of such laws. He is concerned, rather, to resist the idea that the apparent regularity in the behavior of objects be understood as the result of their being designed to behave in this fashion, for in Greek thought regularity of behavior as a rule is associated with design by an intellect. The planets are taken to be supremely intelligent, if not wise, because they move with an extreme degree of regularity. If an object is not intelligent but displays regularity in behavior, it is readily thought to do so by design of an intelligent agent. Democritus's point is that the apparent regularity in the world is not a work of design, say, by an Anaxagorean cosmic intellect but a surface phenomenon produced by the aimless, random motion of the atoms. Thus apparent regularity is supposed to be explained in terms of randomness. But already in Epicurus's day there was the temptation to think of the motion of the atoms as itself regular. Hence Epicurus, to avoid this misinterpretation of his own atomism, tries to insist on the irregularity of the motion of the atoms by claiming that they swerve from their paths without cause. Epicurus's doctrine of the swerve, it seems to me, has been widely misunderstood as a doctrine which is meant to explain human freedom, as if a postulated swerve of atoms in the mind could explain such a thing. Epicurus's point is, rather, that, since the world is not deterministic in this way, it does not constitute a threat to the idea that some of the things we do are genuinely our own actions, rather than something which happens to us or something we are made to do. But here is at least an envisaged possible view, which is not fanciful at all but is rather close to what we call physical determinism. According to that, the world puts constraints on what we can do, which are such that we cannot but do whatever it is that we are doing and hence might systematically prevent us from doing what we would need to do to live a good life. The doctrine which in antiquity comes nearest to physical determinism in our sense, and was actually espoused, is the Stoic doctrine of fate. According to the Stoics, everything which happens has antecedent physical causes which form a chain reaching back as far as we care to trace it. But even this form of universal physical determinism differs radically from its modern counterpart. First, Stoic fate is the work of an agent, namely, God, whose plan dictates the way the world evolves and changes, including what we ourselves do, down to the smallest detail. Modern determinists, in contrast, do not normally believe in a cosmic agent who determines things. Second, this plan is providential precisely in the sense that the Stoic God predetermines things in part with regard to us, taking into consideration what his determination does to us and to our life. Modern determinists, however, will find it natural to think not only that everything we do is predetermined but also that our choices and decisions are predetermined entirely without regard to us. Third, in a curious twist to the Stoic position (and with nothing comparable in the case of modern determinism), the divine plan itself seems to be contingent on our choices and decisions, in such a way that God anticipates them in determining the way the world evolves. In any case, God in his providence sets the world up in such a way that there are no constraints imposed on us from the outside which would systematically make it impossible for us to do what we need to do to live a good life. So here we do have a form of causal determinism, but it was a matter of dispute whether it posed a threat to freedom or not. Tellingly, those who argued that it did, like Alexander of Aphrodisias, conveniently disregarded the idea that, on this theory, our choices are not just the product of fate but themselves to some extent determine fate. Universal causal determinism, though, was not a view which had many adherents in antiquity. This was not because the ancients believed for the most part that things happen without a cause or an explanation. For the most part they came to believe that things do have a natural cause or explanation. But they had a very different conception from ours of what constitutes a cause or explanation. Perhaps the most crucial difference is that nobody in antiquity had the notion of laws of nature, meaning a body of laws which govern and explain the behavior of all objects, irrespective of their kind. For the most part, at least, philosophers believed (and this is true, though in different ways, of Aristotelians, Platonists, Stoics, and Epicureans alike) that the most important factor for one's understanding of the way things behave is the nature of an object. If you wish, you can think of the nature of an object as something which could be explained by a set of principles and laws which govern and explain the behavior of objects with this nature, for instance, plants or stars. But they are principles and laws governing a specific set of items. The nature of an object puts certain internal constraints on what objects of this kind or nature can do. Human beings, for instance, cannot do everything; just because they are human beings, they cannot fly, even if they wanted to. But there are also lots of things the nature of an object enables it to do. For instance, the nature of a sunflower enables it to turn in the direction of the sun. In fact, it makes the flower turn towards the sun, when the sun is visible. Quite generally, the nature of an object is such that, given certain specifiable conditions, it cannot but behave in a certain identifiable way. It is only when we come to more complex animals and, of course, to human beings that the behavior is not entirely determined by the nature of the object and the circumstances or conditions the object finds itself in. Animals can learn, be trained, or even be taught to do certain things. Different animals of the same kind might behave quite differently in the same circumstances. Their behavior is not entirely fixed by their nature or the laws of their nature. And, notoriously, human beings have to be trained and taught and educated. They have to learn a lot before they are able to act in a truly human and mature way. What is more, and what is crucially important, human beings have to actively involve themselves in acquiring the competence it takes to lead a truly human life. It is certainly not by their nature that human beings act virtuously. Given a view of the world in which what happens is largely accounted for in terms of the nature of things, there may be nothing which does not have a natural cause and explanation, but, given the kinds of causes and explanations appealed to, the world might remain in our sense causally underdetermined, leaving enough space for us to live our life as we see fit. But, as we come to late antiquity, there is a growing sense that at least the physical world may be determined. Yet by then, of course, there is also the view, which rapidly spreads, that the mind is not physical. In any case, the notion of freedom gets its point only from the fact that there are available at the time numerous views about the world, according to which we are under such constraints as to possibly, if not necessarily, be unable to do what we need to do to live a good life. With this we come to the combination of the two notions of the will, on the one hand, and of freedom, on the other hand, in the notion of a free will. Given the view that our actions are caused by a choice or a decision of the will, our freedom to do the things we need to do in order to live a good life must involve the freedom to make the choices which need to be made in order to produce the actions which need to be taken. This, however, is a trivial connection between the will and freedom. It would hardly explain the great emphasis on the freedom of the will. A less trivial connection is this. We might act under such constraints that the choices we have are so limited that they might not produce a good life. Just think of a cosmic tyrant who again and again confronts you with a choice like this: having your children killed or betraying your friends; or killing your child or being condemned for not obeying the order to kill your child. This too, though, would hardly suffice to explain the emphasis on freedom of the will. A still more promising connection is this. As soon as we think of a world run by a cosmic tyrant-or by planetary intellects and their daemonic minions who have access to our mind, perhaps can manipulate it, and perhaps can systematically try to prevent us from gaining the knowledge we would need to live a good life-we can see that there is a special point in emphasizing the freedom of the will. No cosmic power has such a force over our minds as to prevent the will from making the choices it needs to make. There is, though, yet a further connection. By the time we come to late antiquity, most people think that in one important sense our freedom is reduced to the freedom of the mind and in particular the will. For, even if we choose to act in a certain way, we have no control over whether we shall succeed in doing out there in the world what we decided to do in our mind. We may decide to cross the street but be run over as we try to do so. We may decide to raise our arm, but the arm does not rise. The doctrine of a free will is certainly not a doctrine to explain how we manage to raise our arm or cross the street. It is, rather, a doctrine of how we are responsible for raising our arm, if we do raise our arm, irrespective of the fact that the world out there is populated by agents of various kinds who might thwart our endeavor. At least for Stoics, Christians, and, to a lesser degree, Platonists, there is also divine providence, which already has settled ab initio whether what we decide to do fits into its plan for the best possible world and hence will be allowed to come to fruition. Where does the notion of free will come from? How and when did it develop, and what did that development involve? 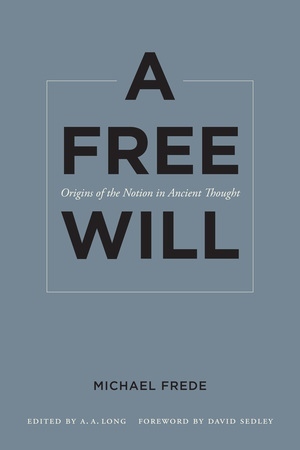 In Michael Frede's radically new account of the history of this idea, the notion of a free will emerged from powerful assumptions about the relation between divine providence, correctness of individual choice, and self-enslavement due to incorrect choice. Anchoring his discussion in Stoicism, Frede begins with Aristotle--who, he argues, had no notion of a free will--and ends with Augustine. Frede shows that Augustine, far from originating the idea (as is often claimed), derived most of his thinking about it from the Stoicism developed by Epictetus. Michael Frede, who died in 2007, held positions successively in the departments of philosophy at the University of California, Berkeley, Princeton University, and Oxford University, where he held the Chair of the History of Philosophy. In 1997-1998, he was Sather Professor of Classical Literature at UC Berkeley, where he delivered the lectures that make up this volume. A. A. Long is Professor of Classics, Irving Stone Professor of Literature, and Affiliated Professor of Philosophy at the University of California, Berkeley. He is the author of Epictetus: A Stoic and Socratic Guide to Life and From Epicurus to Epictetus: Studies in Hellenistic and Roman Philosophy. David Sedley is Lawrence Professor of Ancient Philosophy at the University of Cambridge and the author of Creationism and Its Critics in Antiquity (UC Press). "As readers will quickly discover, the quality of the text that [Frede] has bequeathed fully matches the brilliance and incisiveness for which all his work is admired." Chapter 9. Augustine: A Radically New Notion of a Free Will?